Last week my wifes Gen 3 hydraulic brake booster finally gave up while she was on her way from my brother in laws house. The ABS light and Brake light came on and then a constant buzzing sound from the dash suddenly..so she pulled into a neighborhood. She still had brakes so she called me and told me the issue and she was about less than a mile from home so I said try to make it home. When she proceeded to go home she lost her brakes completely...pedal got very stiff with little to no brake pressure, she pulled into a super market parking lot relying on her E-brake. I got home and started to diagnose and after some quick research I read the culprit is the pump motor so I checked for that 1st. I turned the key on the "ON" position and you should hear the pump/accumulator cycle but I didn't anything at all. After attempting to check a couple times the pump was definitely the pump motor. I ordered a HBB unit from a fellow Montero owner from the FB for sale groups and he came through with a very reasonable price and shipped it out promptly. Once I received it i prepped the unit and proceeded to install it and go through the normal way I always bleed my systems for year with my bleeder kit. I was having no luck...pedal was going straight to the floor even with pressing the pedal 30-40x's to prime the accumulator. I was hearing and seeing the pump cycling when I had the key on the ON position but I couldn't get the system to bleed correctly. 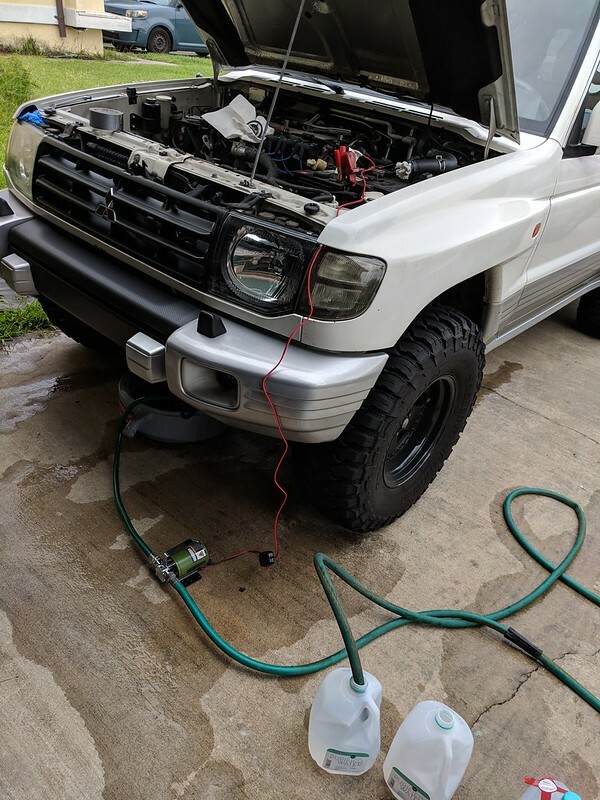 I found this article on a Pajero owners group and followed the steps they posted and it worked for me. Also this link has tips on diagnosing and repairing the HBB pump motor. I found out the Toyota and Lexus share the similar Aisin HBB units. 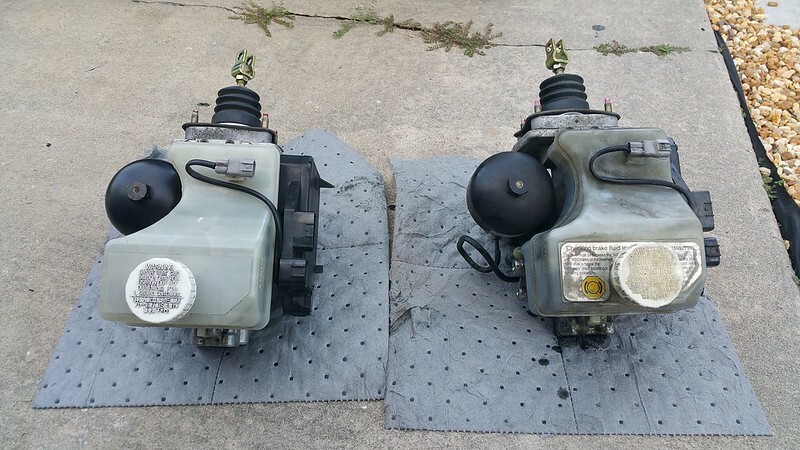 The design of the units are different..but seems they all use the same pumps at the Gen 3 Monteros so this allows for more options to find a replacement motor. I will most likely get the original failed HBB sent out for a rebuild. Rockauto has a procedure to send your HBB out for a rebuild...I believe its $300 to get it rebuild. Taking out the HBB is really simple. 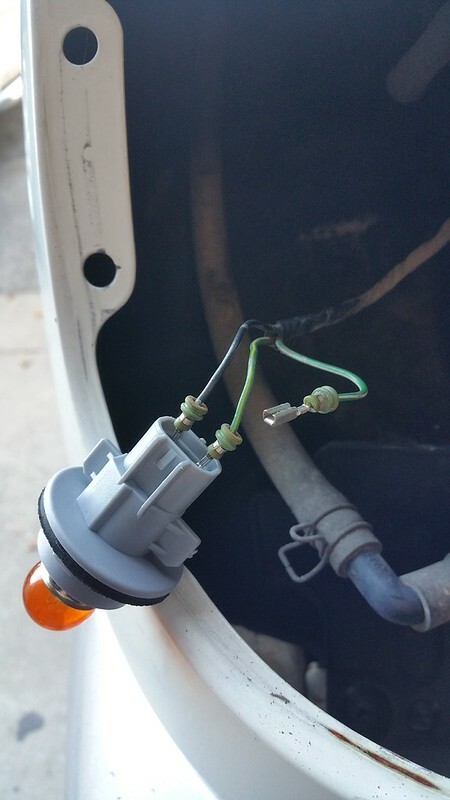 -Disconnect the pin where the brake pedal attaches to the HBB unit which is a cotter pin and the lock pin slides out. -x4 12mm mounting nuts inside firewall. 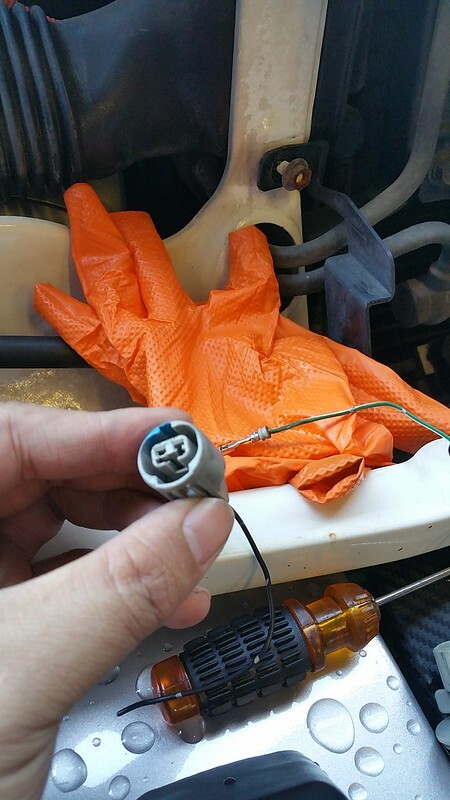 I was eventually successful bleeding the system and after driving the Montero for 30 mins...the HBB unit sorted itself out and pedal feel got closer to normal and the ABS and BRAKE light eventually went off including the buzzing sound after the HBB unit cycled a few times. Does anyone have a spare set of stock amber corners laying around they want to sell? 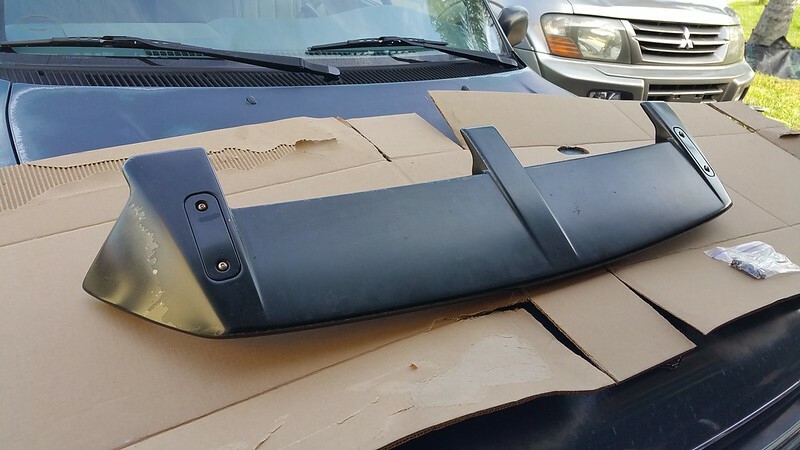 Some of you may know my side business is selling older Japanese cars/suv/truck parts and accessories. Typically I cater to the Mitsubishi owners since well...I am a Mitsubishi fan. 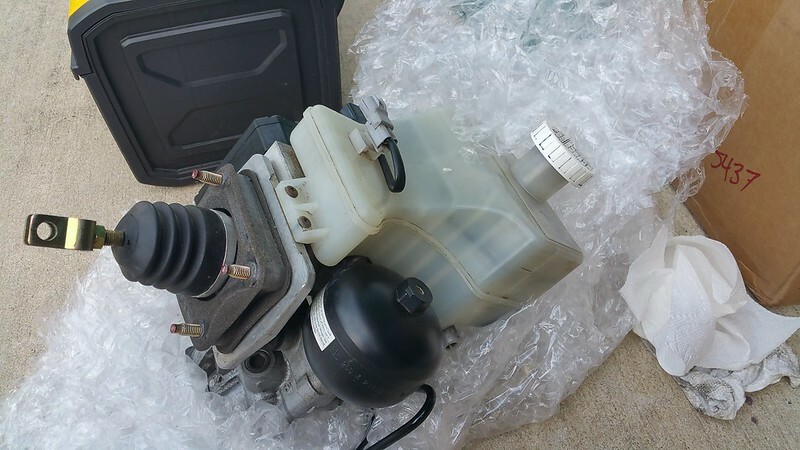 When I run into a Montero (Which is rare where I live) I try to get as much parts as I can and sometimes people message me on a list of parts they need I try my best to get them. This thread will have a list of parts that I will have for sale and I will update each post if they are SOLD. You can also follow @nostalgic_jdm407 on Instagram and Nostalgic JDM on Facebook for my FL posts too. My radiator was pretty clogged and I had it rodded out and the radiator shop owner highly recommended me to flush out to remaining coolant in the system which could have debris in the coolant that clogged my radiator in the 1st place. I researched on the internet and youtube and kept running into the garden hose method which be fine and dandy in area with cleaner tap water than florida. I live in Florida and our tap water isn't the greatest as its known being "hard water" due to the limestone content and other minerals and I honestly didn't want that running through my cooling system. 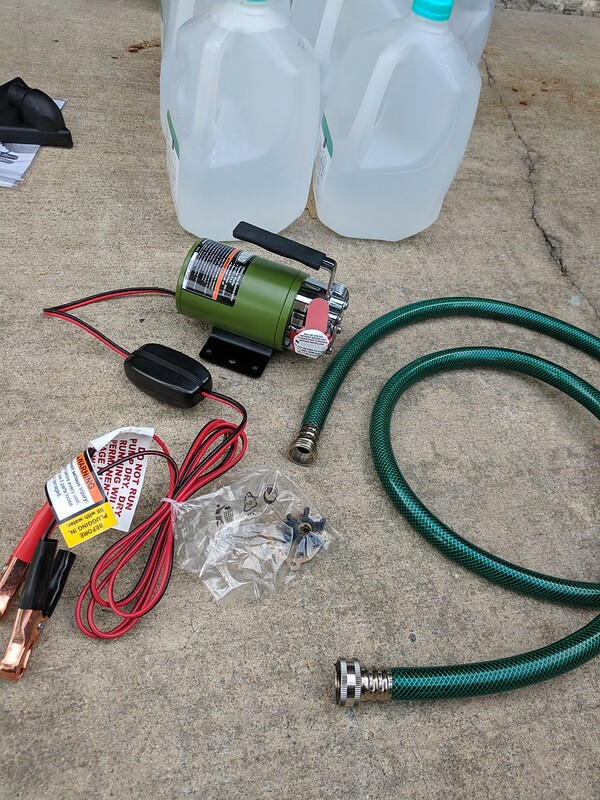 I thought of the idea of running distilled purified water using a transfer pump instead and went ahead and bought what I needed to try this method out. I bought this transfer pump from Harbor Freight which cost me $40 and pumps 240 gals a hour which would simulate the water pressure of a water coming from the hose. Pump comes also with a short garden hose and extra gasket and impeller wheel. Alligator clips clamp to the battery with a on/off switch and this pump works very well. For the input I used a spare garden hose. I strongly recommend if you use this method try to find a short garden hose as possible to make it easier for the pump and accurately "measure" the water being transferred. Also prime the input hose before switching on the pump to prevent burnout of the rubber impeller wheel. 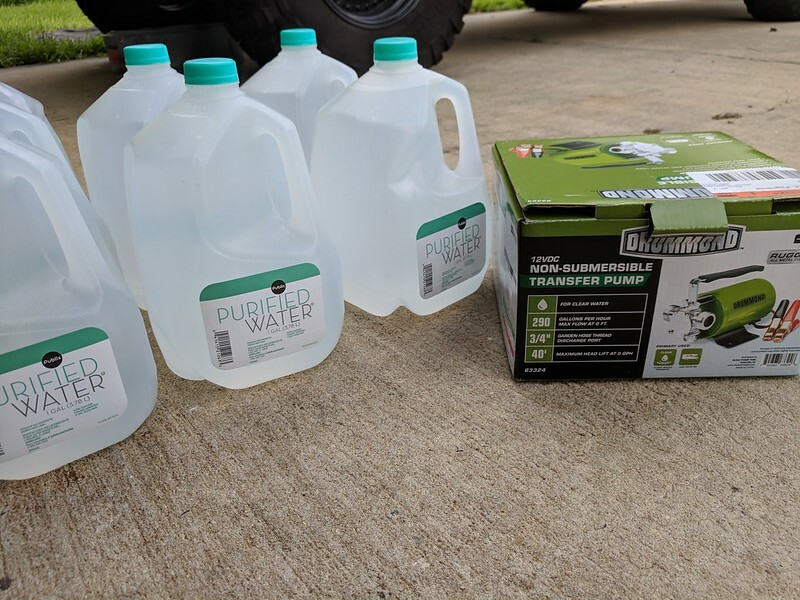 I bought 7 gallons of purified distilled water which were 85 cents a gallon...IMO totally worth it to keep my cooling system in good shape in the long run. 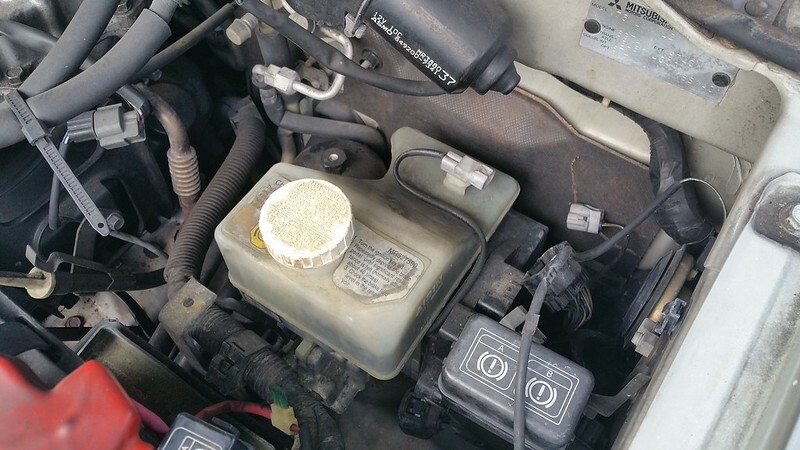 Make sure you remove the thermostat prior to flushing out the system and reinstall the cover. Make sure the hose coming from the output of the pump runs where the lower radiator hose inlet. I used duct tape to seal the garden hose so water doesn't leak out. 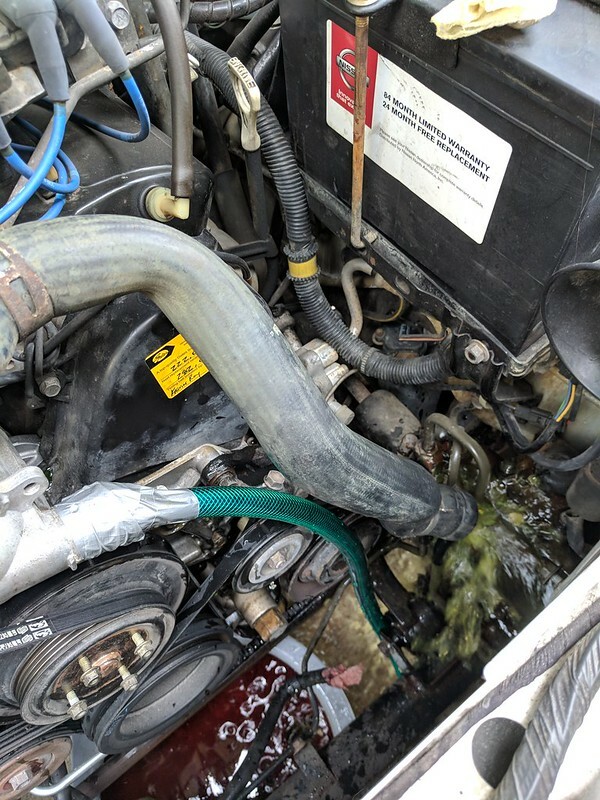 Now since the water will be coming out of the upper radiator hose outlet you will have to figure out a way to guide the water to flow a different direction. 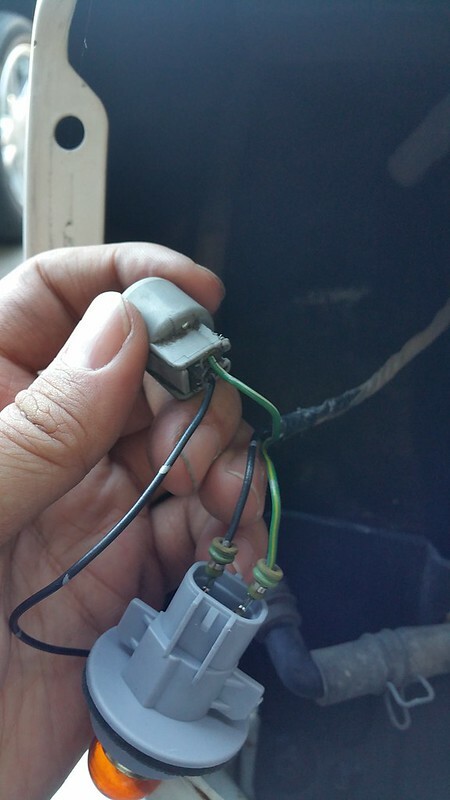 If you just leave the outlet open it will just spray all over the battery, fuse box, etc area. I found a spare lower radiator from my 96 Galant and it was shaped and long enough to guide the water towards the bottom area where the steering gear is at. Once you have it all sorted out switch the pump on and it should start pumping water through the system. It will be gushing out a lot to keep an eye on the water level of what the pump is transferring, you don't want to run the pump dry and destroying the impeller wheel. 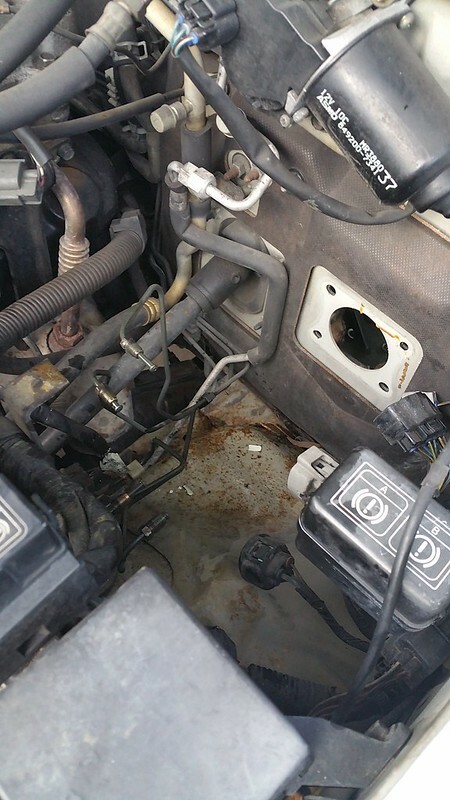 Once you see the water coming out clear..your system is flushed and you can reinstalled everything back in and take the normal steps to make sure you burp your cooling system and test drive the vehicle to see if there are any leaks. 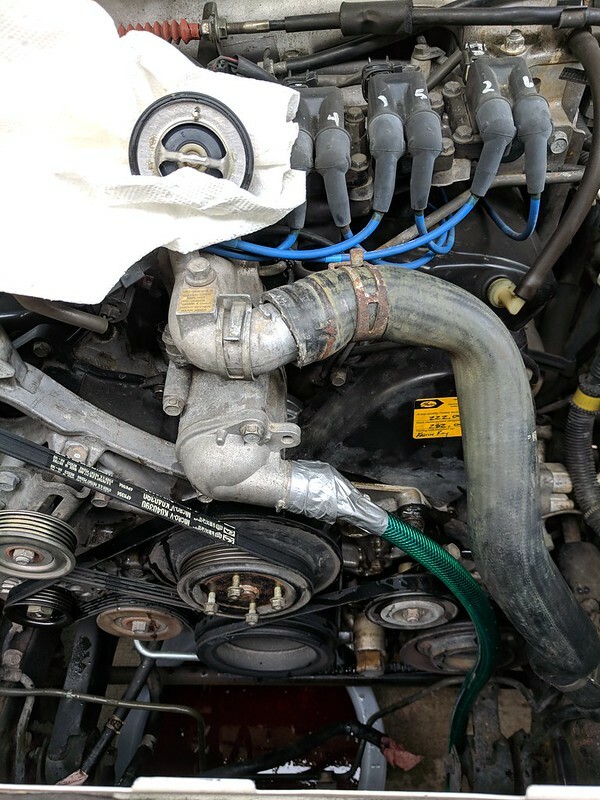 Tip from the radiator shop owner: He said after you flush the system, fill it with concentrated antifreeze since there is already water in your system to keep the ratio "50/50". These items are for sale brand new never installed. 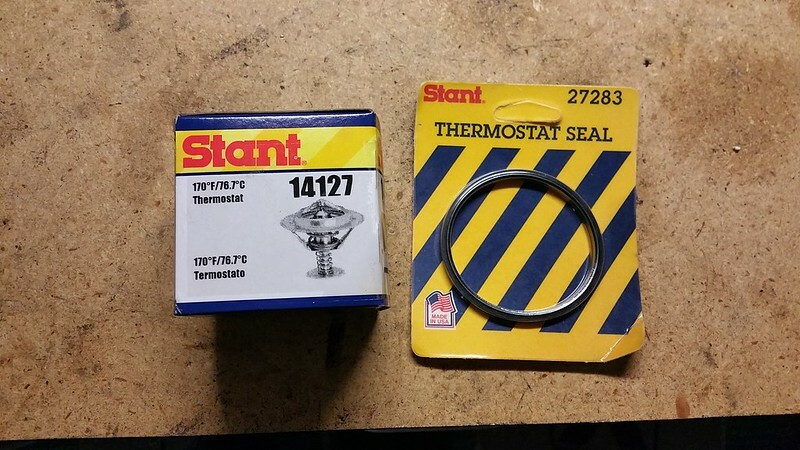 Stant thermostat and gasket are brand new and never used. I used a OEM thermostat instead. 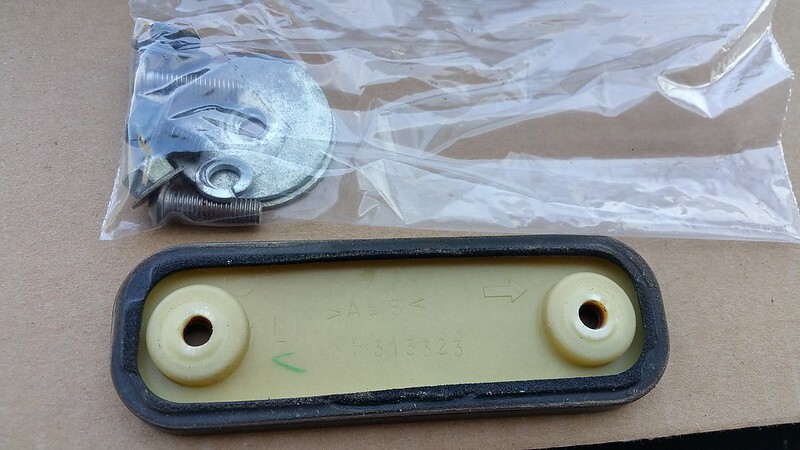 Gates Idler and Tensioner pulleys. I didn't realize I bought the Gates timing belt kit and that these came with the kit and ended up buying these separately. Will include O-ring that goes to that valley coolant pipe that run from the thermostat housing to the rear crossover pipe. 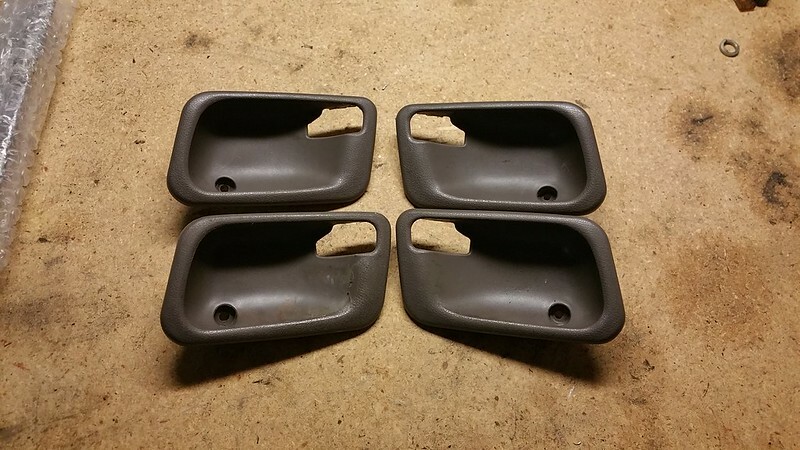 For Sale: $30 shipped (for both) Cont U.S.
Set of Brown interior door handle bezels from a 97 Mitsubishi Montero. For sale: $15.00 shipped cont. U.S. 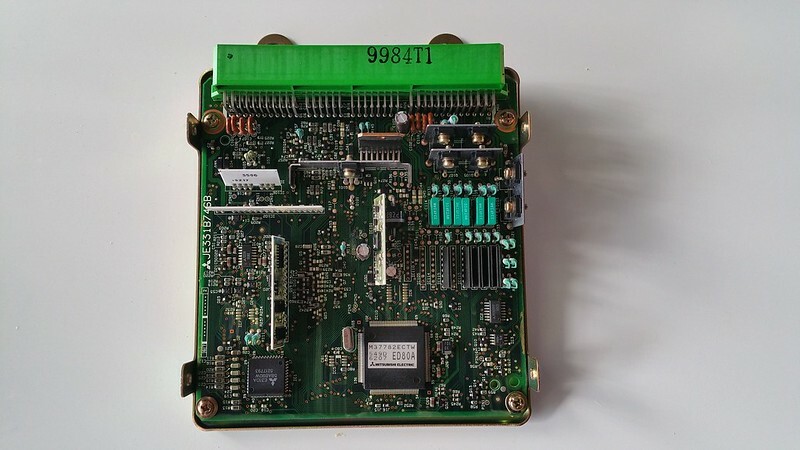 This ECU was from a 1995 Mitsubishi Montero SR (DOHC 3.5L 6G74). Capacitors and board look good. 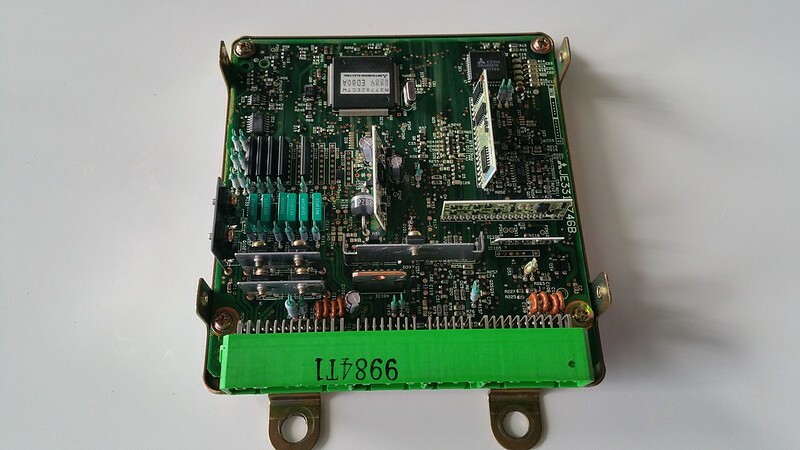 Please verify this ECU is compatible with your Montero before purchasing. 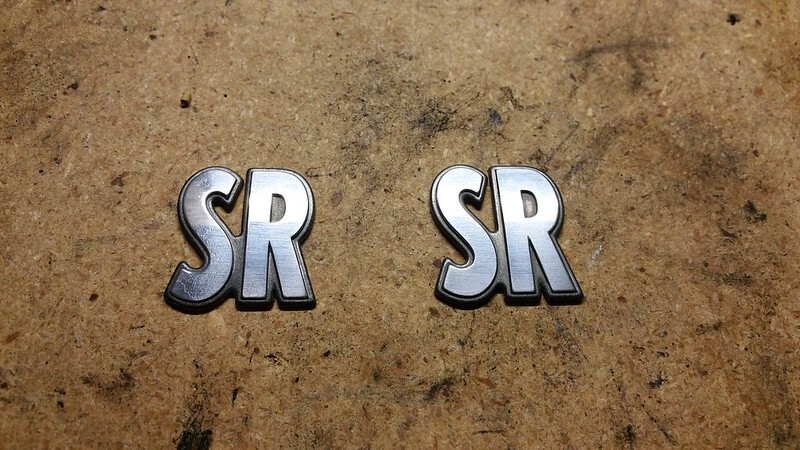 These are badges from a 1997 Montero from Puerto Rico. They are in great condition. For sale: $20.00 Shipped Cont. U.S. 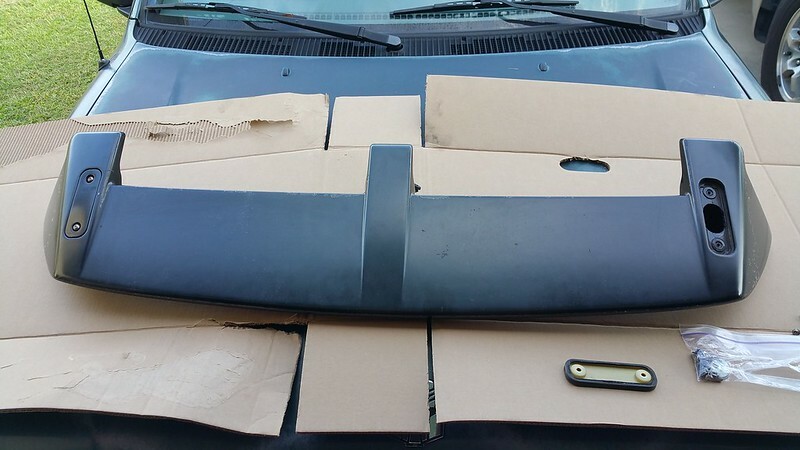 This is a authentic OEM Mitsubishi part for sale from a Pajero Sport. 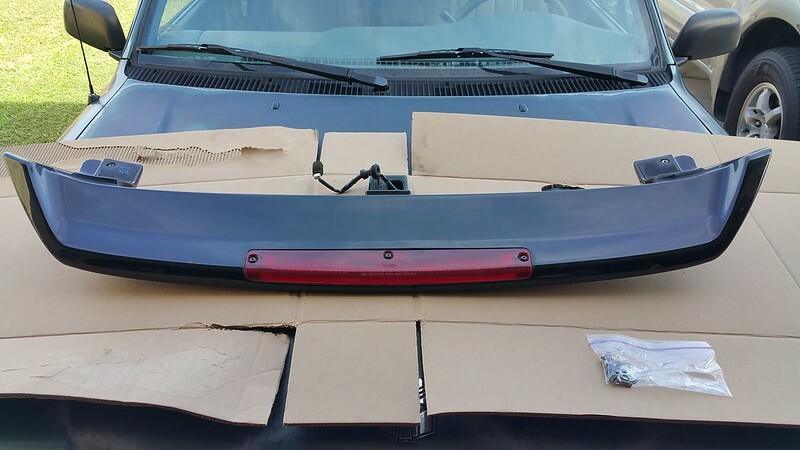 This will fit 1st gen Montero Sport/Shogun Sport/Challenger and Nativa from . 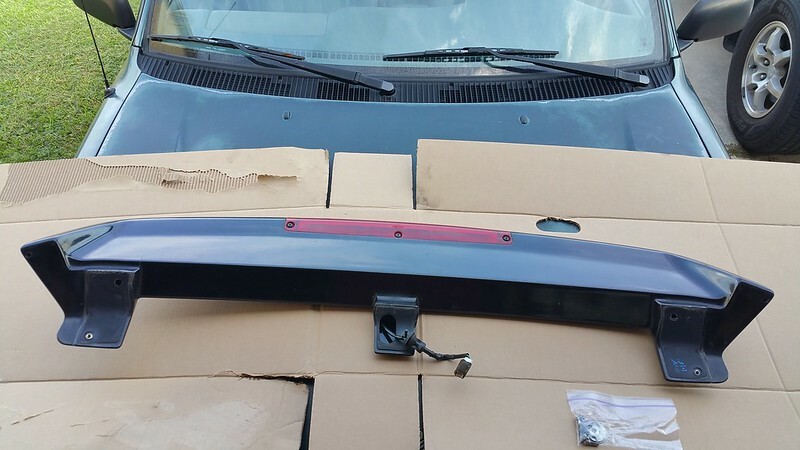 Comes with OEM hardware and LED 3rd brake light w/ pigtail and plug in great condition..just need to be repainted. Mitsubishi Related / How to wire up JDM corner lens to UDSM Monteros. For those looking to swap your usdm amber corner lens for the JDM corner lens. Since the USDM's have a single socket for a dual filament bulbs you will have to rewire to work with the JDM corner lens since the driving and signal lights are separate. -1st you will have to remove the corner lens which is easy to do. You will have a Philips head screw in the end of the inside fender which holds the bracket of the lens that is removed. In the inside of the fender you will see a spring and hook...just unhook that from the fender. Take you flathead screwdriver I recommend covering the end with some type of cloth so you don't damage the lens and gently pry the lens towards you where the headlight and lens meet and should pop right out. -Unhook bulb socket from plug or just unlock the whole bulb socket from the corner lens. 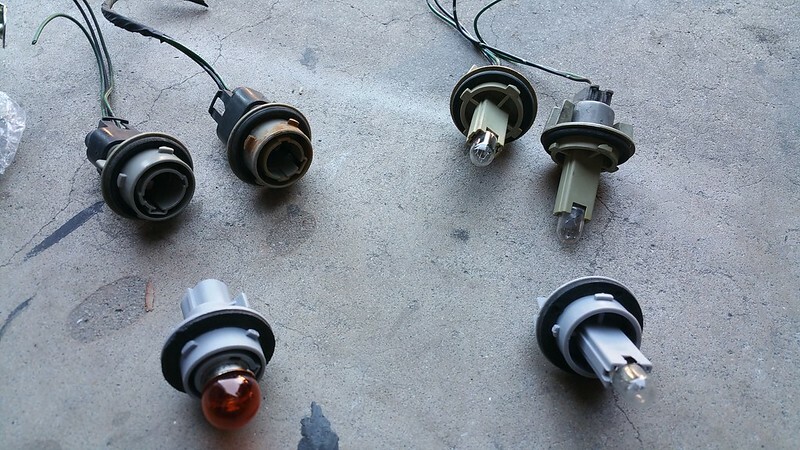 -I try to keep things "factory" like so I wanted to find the bulb sockets that would work with the supplied bulb plugs that came with the JDM corner lens. 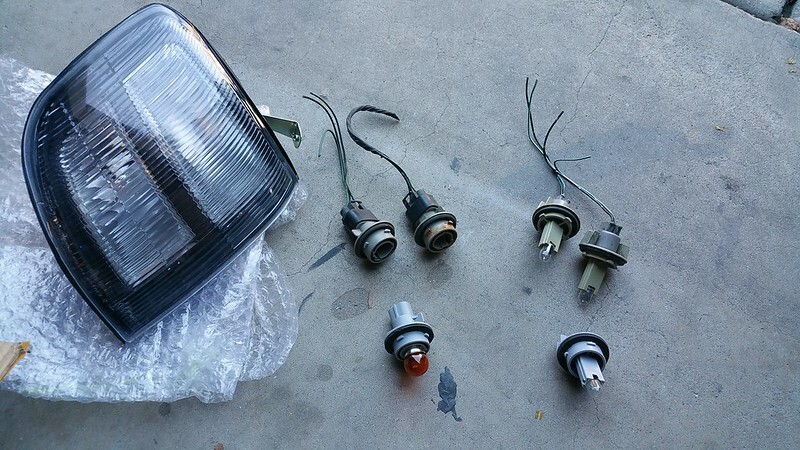 **The turn signal light socket I have not yet found to match the JDM one. I will update this when I do. 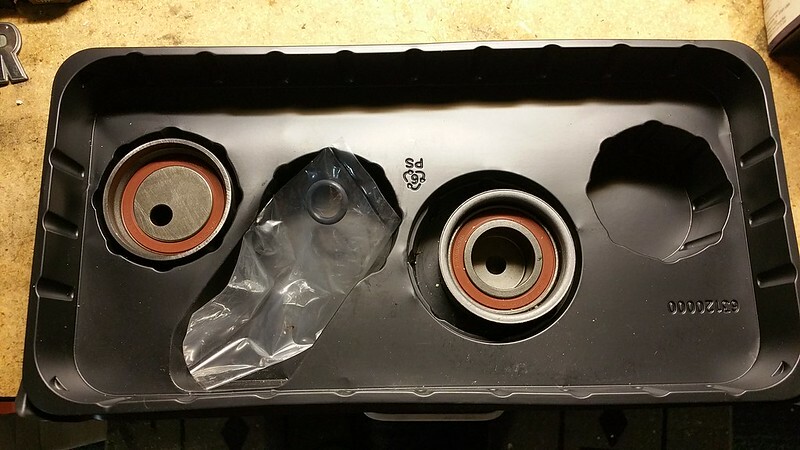 Above is a comparison of the JDM sockets that came with the corner lens and the ones I pulled from Mitsubishi vehicles in the salvage yard. For the signal the closest one to fit are from a 7th gen Galant but the socket plugs do not screw right up to the JDM sockets. The driving light sockets are exact match to the Mitsubishi Expo. 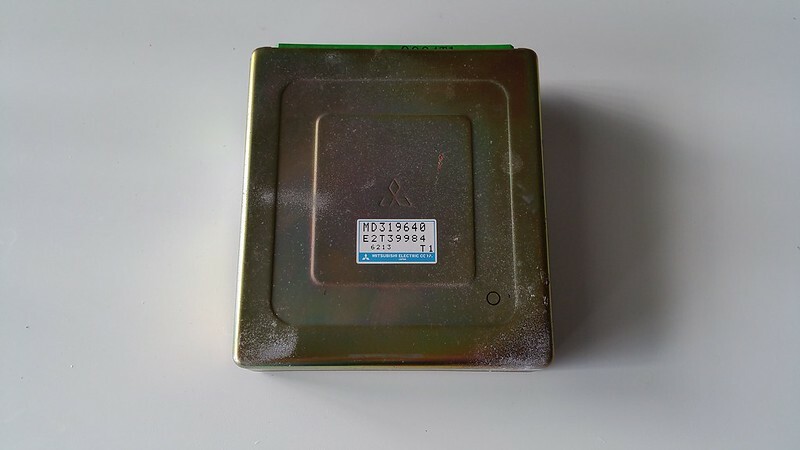 What you will need to do on the USDM single socket plug is remove the pins from the socket. There will be 3 pins with 2 positive wires indicated in green and a single ground pin (black wire). You will need to use a needle picker or a really small flathead screwdriver to remove the pins from the socket. If you cut the pigtails for the sockets you will have to remove the wire pins also the same way OR splice the pigtail wires to the existing harness on the Montero. As stated above I haven't found a plug to match the provided socket on the JDM corners so for right now the pins are directly plugged to the socket male pins. The signal bulb is on the top part of the JDM corner lens. The signal power wire is green with the yellow stripe. If you look into the socket the negative pin contact is higher on the wall of the socket while the positive is lower...just follow the contact to the associated pin and connect the wire pins accordingly. Now for the driving lights you will do the same except since there is only 1 ground wire on the USDM harness you will have to splice another ground wire to the existing ground wire. 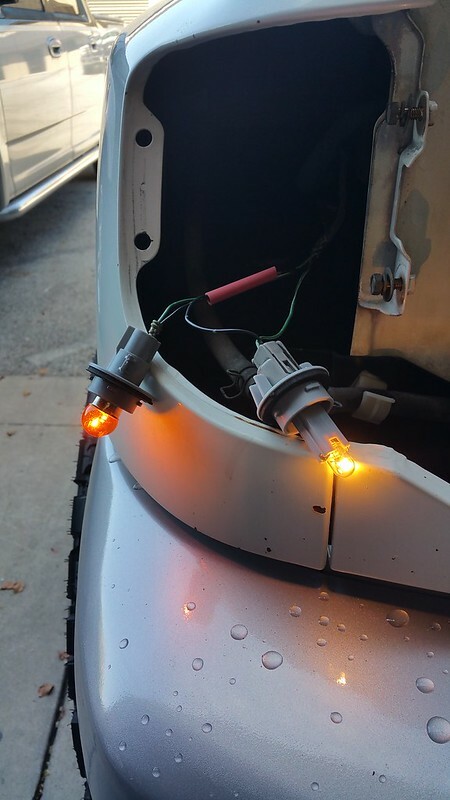 I soldered the extra ground wire for the driving lights ...I recommend doing this. Same rules apply wiring the socket and plug like the signal bulb as far at matching which is positive and negative like the signal socket. Once you got the sockets wired up make sure test them out to see if the lights work as they should and make any corrections needed. Do this especially before you decide to apply heat shrink like in the pic above just in case you have to fix a issue in the wiring. 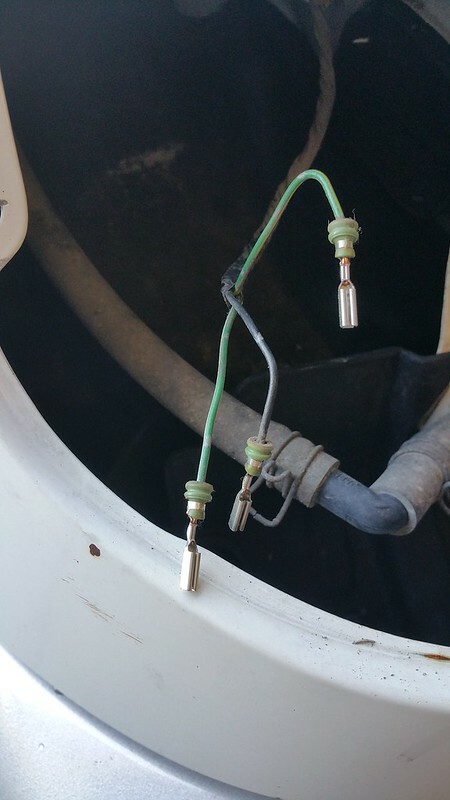 **The supplied turn signal bulb on the JDM corners worked but if you use them you will run into the issue where w/o the brake applied they "pulse" normally but when you apply the brakes they will have a more rapid frequency. This is because of the bulb resistance and also the supplied bulb isn't bright. I switched to a 1156a amber bulb which is bigger and works properly and has a brighter light output. I recommend switching to this bulb if you convert to JDM corners. I will update this tutorial with more detailed pics. Gen 2 Montero / Speedometer and Odometer not functioning. Like the title says...both stopped working last Friday going to work. Speedometer would work normally then start the needle would go all over the place on the way to work and when I went to go home it continued to do the same and halfway home it just stopped working all together. I looked through the FSM a little bit this weekend but will have to look a little more but I called Mitsubishi today and they say there is are Vehicle speed sensors on the transmission. Has anyone had this issue before and how you diagnosed the issue? This is on my 98 Gen 2.5 btw. I have a White ball shifter to replace the inferior gen 2.5 red ball shifters that like to self destruct. 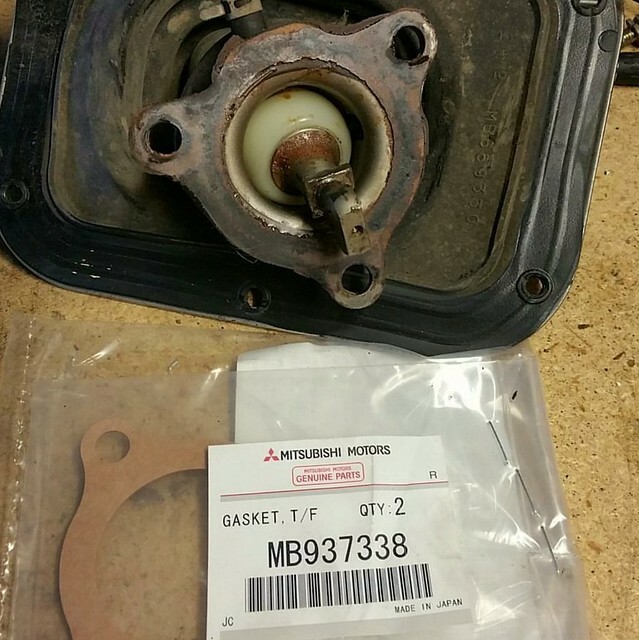 Comes with a new OEM gasket also. Anyone got a spare passenger side window/lock switch for grey interior? Reply or message with price shipped to zip 34743. For Sale Automotive / Craigslist/Autotrader/Cars.com etc etc finds! Thought I would start this thread for those that may of run into some Monteros for sale to help those searching for ones in the community.